Can Gum Disease in Memorial Contribute to Heart Disease? Gum disease in Memorial is a condition that affects over 85% of adult Americans, and, unfortunately, it is still on the rise. Given that the mouth is the window to overall wellness, can the related toxins contribute to heart disease? That question is answered as you continue reading, and you’ll also learn about ways to prevent and treat the condition. When gums become inflamed as a result of excess and prolonged bacteria growth, the condition is referred to as gum (periodontal) disease. 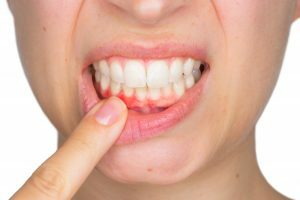 If not treated, it can lead to permanent damage to the connective tissue and bone that hold your teeth in place. Some of the usual symptoms are easily-bleeding gums, red spots, increased sensitivity and chronically bad breath. The problems aren’t isolated to the mouth, though. Plaque Buildup – The sticky nature of plaque can cause blockages and limit the transportation of vital oxygen to the heart, which can lead to cardiac arrest. Inflammation – The excessive bacteria accumulation associated with advanced forms of gum disease can cause inflammation (the collection of fluid). Wherever this problem exists in the body, toxins are allowed to pool, which can eventually become life-threatening. Since advanced gum disease increases the chances of developing heart disease by 20%, it’s important to approach the treatment and prevention of the condition with a sense of urgency. The treatment for gum disease can vary depending on the severity of the condition. For mild cases, a dentist may recommend some improvements in your oral care routine. More advanced forms may require a common procedure called a scaling and root planing, which involves the removal of bacteria beneath the gums and the smoothing of the tooth roots to prevent the attraction of new bacteria. The best way to prevent gum disease is to practice oral hygiene on a regular basis. This should include brushing and flossing your teeth at least two times a day, which will help to limit the growth of bacteria. An additional way to avoid any unnecessary suffering is to maintain six-month visits with your dentist for cleanings and examinations. Along with removing any lingering plaque and tartar that cling to your teeth and at the gum line, these appointments provide an opportunity for your dentist to identify any developing issues so they can be addressed relatively quickly. So to prevent poor heart health related to gum disease or to receive periodontal therapy in Memorial, reach out to your local dentist to schedule a visit today. Dr. Mark Gray is a graduate of the University of Texas Dental School. He has since gone on to provide nearly 40 years of expert and compassionate care. To continue to expand his knowledge and broaden his skillset, he has maintained affiliation with the Spear Education Group and the Seattle Study Club. Dr. Gray helps patients prevent and recover from gum disease at his private practice, and he can be reached for more information through his website. Comments Off on Can Gum Disease in Memorial Contribute to Heart Disease?